eCoachManager has long been at the forefront of assisting coach and bus transport companies streamline their businesses. The software is perfect for any kind of vehicles that form a fleet. And if you are embracing green technology in your business and investing in electric vehicles, then eCoachManager could be the perfect assistant to your business. In the field of public group transportation, alternative fuel and greener ways to operate the fleet is now a real consideration. In a precursor to the IAA exhibition in Hanover, Daimler have released details of their full electric Mercedes-Benz eCitaro together with news of a new version of the citybus Sprinter. Daimler have already unveiled their electric Citaro earlier in 2018 but the new press release is far more detailed. The previous unveiling hid some dramatic details but the shackles were off and the new vehicle was fully exposed. The new look is based on the Future Bus concept with a bold frontal appearance with a sleek roof with no humps. The aluminium extrusion that is used for the roof side panelling is two tone, the lower part black so it looks like an extension to the windows making an optical illusion that the roof is shallower than it really is. A quote by a Daimler spokesman was, The essence of eCitaro is what it can do for the environment, how future-proof it will be and how easy it will be to operate. The eCitaro has an interior that is as modern as the exterior and has a futuristic look to it. 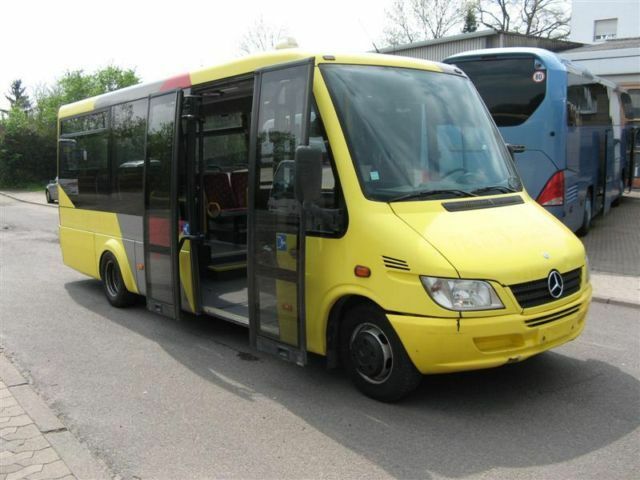 The seat design is quite radical that will carry on to the rest of the Citaro range, and the changes reduce the number of components both in the seats themselves and the fixings. The roof has been described as coffered, but does not contain the previous sunken sections as before. Rather the roof is rather flat and if anything a slightly arched middle section that has a pegboard surface. LED lighting is evenly-spaces along the entire length and also speakers for the PA system. Around the edges of the ceilings are rounded coving that includes the air conditioning system with the ducts now being textile and not plastic. All the trimmings of windows and sills are is black and the seats have a striking black and white finish that is almost in a camouflage pattern. The essence of the new eCitaro is not really how it looks, it is how it helps the environment and how future-proof the vehicle will prove to be, and of course how easy it will be to operate. Things are changing in the automotive industry and buses are at the forefront of these changes because they move vast amounts of people and operate in sensitive areas such as towns and cities. Daimler are set to invest a further 200 million in the field of electric, connected and automated driving over the next three years. Martin Daum who is a member of the Board of Management for Daimler was quoted as saying, We are shaping the future of the public transport network – and that is of great significance to our customers, to society and of course to us at Daimler Trucks and Buses as well. If you would like to know more about great news stories like this, keep in touch with our blog pages as they are updated on a regular basis.